Time Tracking and Scheduling for Mobile Workforces. Time tracking and scheduling are a mess. Everyone’s going different directions. Nobody seems to fill out their timesheets right. Or, they don’t bother to turn them in at all. To make it worse, you have to get the schedule to each and EVERY employee. Except the schedule keeps changing and no one seems to know which direction to go. Except you. But you can only do so much - there’s only one of you! But the good news is, it doesn’t have to be this way. Easy, powerful time tracking and scheduling built for companies with mobile employees - that’s ClockShark. Mobile Time Tracking Meet Mobile Workforce. Instant Best Friends. Mobile workers need mobile time clocks. When your time clock travels with you, you can use it in real time. That means accurate and complete data. Now everyone’s happy, including your boss. Get ready for that promotion! What's better than easy to use mobile time tracking? Time tracking and scheduling together! With ClockShark you get scheduling at no additional charge. It's included. Manage Paid Time off Policies Effortlessly. Whether you’re using pen and paper for requests or spreadsheets that track accrued vacation and sick time, the manual way of doing PTO is over. Welcome to simple. Connecting time tracking to your payroll is a real time saver. Our integrations with QuickBooks Online, QuickBooks Desktop, ADP RUN, ADP WorkForce Now, Xero, Sage, and Zapier allow you to connect with the systems you already use to run your business better. Double data entry and manual keying are things of the past. You've got better things to do. ClockShark makes gathering time data easy. We also make it easy to report on so you can turn your data into actionable insights. Easy to read, clean reports. That comes standard. GPS Time Clock Apps Mean Total Visibility. No More Rounding Up. Never wonder where your employees are or were again. ClockShark's mobile apps use the GPS location of the smartphone or tablet to get location data and include it with every clock punch. That means no more rounding up on timesheets, and 2-8% payroll savings in your pocket. In ClockShark you can set geofences around your job sites or business locations. With GPSFence™ technology the mobile apps can detect those geofences and remind employees to clock in or out. No more forgetting. In addition to the mobile apps, ClockShark also has a web time clock you can use from a computer. If you have office or shop staff, we've got you covered. KioskClock™ transforms a tablet or smartphone into a time station everyone can use. With KioskClock™, multiple employees can quickly clock in from a single smartphone or tablet. Everyone gets an easy 4-digit PIN. Just a few taps on the kiosk, and they're on the clock. A reliable time clock kiosk with no clunky hardware or unneeded complexity, it doesn't get any simpler. Who's Working Now? Let’s Look. Ever wondered where your crew was right this second? Wonder no more. 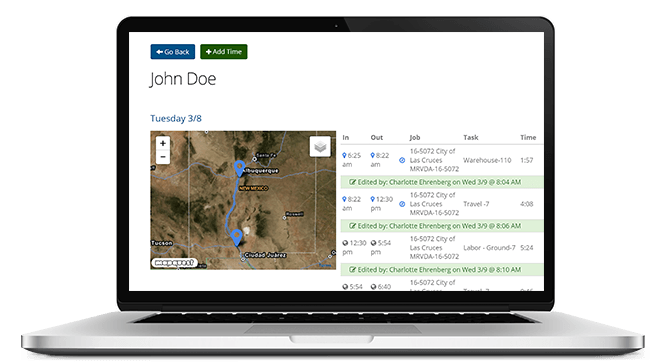 ClockShark can show you where everyone who's clocked in is on a simple map complete with satellite imagery overlays. Yep, you can just look. Simple. Signed, sealed, delivered—don’t forget approved! The most important step before processing payroll is reviewing and approving everything for a pay period. Easily put your stamp of approval on every employee’s timesheet with ClockShark’s timesheet approval. File attachments allow photos and documents to be shared right from the field. Snap a picture of work progress and attach it or other documents right to the timesheet. A picture is worth a thousand words. Aren’t you tired of mediocre? Every aspect of Business is full of it. At ClockShark, one of our core values is that customer support must be nothing less than great. So we actually made a rule against mediocrity. With our help, thousands of companies have made a successful switch to mobile time tracking, and we can help you succeed too. Have a question, want advice or want to learn something? Let us know. We'll be here to help! Mobile time tracking only makes your life easier if everyone uses it. With Timesheet Reminders we’ll prompt your employees to clock in and out so they don't forget. That means less of your time will be spent making edits to timesheets. We’re built for job costing. Employees select a job and labor task with each clock in, so you'll have everything you need for accurate job costing. Now you can start living the dream! Everyone knows elephants have great memories, but so do sharks. ClockShark stores a record of every timesheet edit so you can go back and see all the changes. Forever. Larger organizations can run multiple offices and departments with a single ClockShark account. Employees and reports can be split by locations and departments to give you the data you need. *2-8% payroll savings is an estimate based on customer reports and a study by the American Payroll Association.